The most common errors when installing a waterproof system begin with the first error — choosing a contractor. The best laid plans of mice and men start with that first step that only promises to reverberate throughout the entire project and the waterproofing system’s life. Choosing a contractor can prove taxing, but it is worth the effort and possible aggravation. Looking for recommendations, contacts, portfolio and even waterproofing products planned for use is important. If a contractor installed your deck, for instance, considers requesting recommendations from this individual. Hopefully it will prove fruitful. Don’t be afraid to contact prior customers who have had their projects waterproofed — but contact the ones that received the service some years back to discover the results over time. If permits (when needed) scare a contractor, then there is only one answer — show them out the door. Asking questions and being inquisitive can only help. Any contractor that exhibits disdain or appears uncomfortable because of your questions and concerns should also find the exit. It is your home, it is your deck and it is your responsibility. Waterproofing systems vary and there are plenty of structures that require waterproofing and special treatment. Not all waterproofing systems, in other words, are the same — nor should they share similarities other than to prevent moisture buildup over extended periods of time. With the focus on a deck, the singular mistake that evolves into a domino effect is the simple failure to look around to see what might impact or challenge the waterproofing system. In fairness and honesty, most homeowners and business people know little about waterproofing and the challenges it must confront. They are likely to rely solely on the contractor. They won’t research waterproof products and explore the nuances of applying or designing a waterproofing system. This doesn’t mean that they and their contractor can’t apply some common sense and incorporate some strategies to blunt any challenges to the waterproofing system. A little unfair, perhaps, but the distinction between latent and patent, both legal terms, escapes the typical person. What’s obvious or not obvious, in other words, as to the application or design of the waterproofing system, may not leap out to a homeowner. What they know usually unfolds later when they discover signs of deck deterioration before the warranty lapses as promised by waterproofing contractor or product label. After choosing the contractor and assuring the waterproofing product used meets the higher standards of the industry, the focus should pivot to moisture and how it can overwhelm the waterproofing system. Everything has a lifetime, even waterproofing, and the goal is to create the conditions that the deck will outlive, at least, the warranties. Exposure to the sun, closeness to sprinkler systems, trees, and planters and the failure to address tell-tale signs of deck compromise are extremely important. It is one of the four major challenges to waterproofing integrity. Water, in its various forms, mold and mildew, and man-made contaminants make up the balance. Locating a deck where it is constantly bombarded by sunlight and water, alternately throughout the day, is one of the first considerations. Simply applying a waterproofing liquid to the wood or concrete’s surface is not sufficient. This sun-water battle taking place on the deck’s surface only promises to shorten the life of the waterproofing guarantee of the typical ten years. Re-directing sprinklers and providing shade for the deck can work remarkably well. Unfortunately, that may prove unworkable if the choice is to use trees to shade the deck. Mice (including rats) often use trees to get to decks and roofing systems. They chew away at the wood, compromising the waterproofing treatment and exposing the wood to moisture — that is the heart of the battle and part of this article’s title. Sadly, despite the great beauty, trees also have leaves that fall onto decks. Without the proper and timely maintenance, they to rot and mildew and fungus quickly develops. Just like trees, planters pose their on special danger. Often in an effort to have a beautiful yard, homeowners will apply too much mulch to their planters. They just want beautiful flowers and bushes to adorn their home and deck. Sadly, this commendable effort exposes the deck to moisture. The mulch just fulfills its purpose. But it only holds so much moisture and the water can spill off to the nearby deck, often challenging the posts that hold up the deck floor. One waterproofing technique may appear as obvious to a homeowner. It concerns the spacing of the deck board planks. Wood expands and contracts in response to changes in the weather. When it is cold it shrinks and when it is hot it expands. If the planks are too closely placed, this natural process of expansion and contraction will work to weaken the plank’s hold to the substrate and cause cracking and warping. Coming full circle, the deck owner is again charged with the important task of investigation. 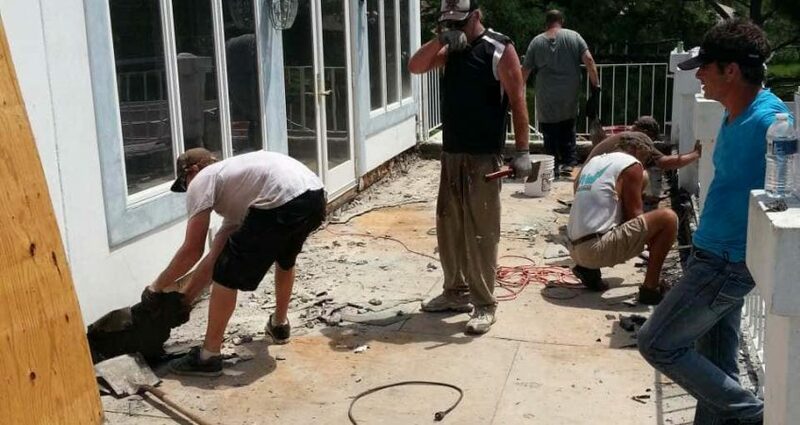 Falling squarely on their shoulders is the duty to inspect for signs of deck deterioration or compromise. Catching cracks, warps, rusting metal (galvanization resulting from dissimilar metals being in close proximity), or wood that appears constantly damp early, are key signs that are strong calls for action. Taking that first important step to the next of locating the deck’s placement set in motion the consequences yet to unfold. Contact us, Pli-Dek Systems, to learn more about how challenges to waterproofing systems extend beyond just beyond the product or system itself.